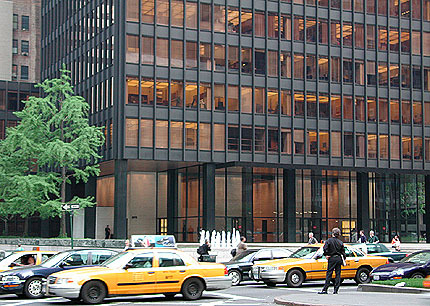 Much copied but not matched, the Seagram Building is generally recognized as the finest example of skyscrapers in the International Style. Much of the building's success comes from its elegant proportions, and its relation to the overall site: the building is set back from the street by ninety feet, and in from the side by thirty. The forecourt so created uses reflecting pools and a low boundary wall in green marble to set off the building, borrowing heavily from Mies' earlier Pavilion in Barcelona (1929). The building's external faces are given their character by the quality of the materials used - the tinted glass and the bronze 'I-beams' applied all the way up the building. 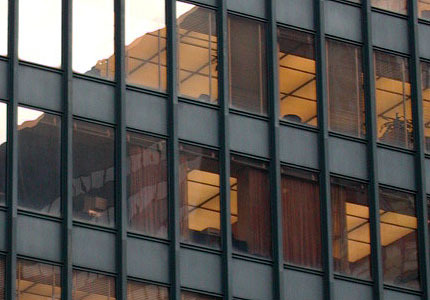 The Seagram Building is the first bronze-colored skyscraper. 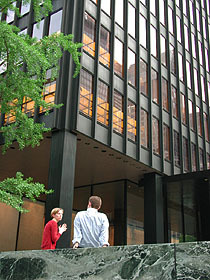 Mies had first used similar applied I-beams (but in steel) at his 1951 apartment towers at Lake Shore Drive in Chicago, welded to the outside of the structural columns. 'His purported aim was the stiffening of the frame of each bay, but more important was the creation of a surface texture that relieved the potential monotony of a smooth facade, while emphasizing the verticality of the overall form. The architect later explained that he had used the device primarily because, without it, the building simply "did not look right." In this Mies was, in the most subtle way, adding ornament to his building, for which he was criticized by the Modernist purists. The building is on the east side of Park Avenue between 52nd and 53rd Streets. It is open to the public, with public spaces inside including the Four Seasons Restaurant (designed by Philip Johnson) and the Seagram Gallery on the Fourth Floor. Tours are conducted weekly, at 3 p.m. on Tuesdays. For further information and opening times call +1 212 572 7000. Subway: 6 to 51st Street; E or F to Lexington Avenue. Bus: M1, M2, M3, M4, M5, M101, M102 to 52nd Street. 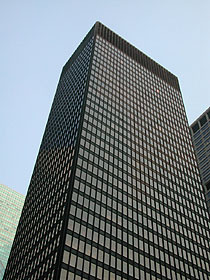 The Seagram building is directly across Park Avenue from Lever House.